When I call my father, I call my mother first. I can hear her bustling around the kitchen as we speak, stomping across the floor with heavy, purposeful footsteps and the phone clutched to her shoulder. When I’m on the phone with my father, we talk about the weather. His words ease out of his mouth the same way he eases about the house, rubbing his hands together before speaking. When he speaks it is like he’s making an announcement – his words have been carefully considered, and people listen. I can see him resting there in his corner of the couch, legs extended and one hand behind his head. I tell him about school, about work, about my kitchen sink that I wish he could fix. I ask him how work is going, is he enjoying his new promotion, has he been driving his motorcycle? I scrape the insides of my mouth for things to say so the silence doesn’t swallow us both. I tell myself that surely, he doesn’t notice how unnatural it feels. Are you going to church? he asks. Sometimes, I lie. It was the silliness of religion – not the irrationality – that first led me to question it. I was twenty years old. I had survived two decades of bedtime prayers, summer Bible camps, and high school ridicule only to be standing in church one Sunday, overwhelmed by the fact that it was all so…silly. I watched the worship leader with jeans tighter than mine jump up and down shouting something vague about how we should all run to God, and everyone in the crowd was jumping up and down like popcorn kernels in hot oil, and all I could think about was how ridiculously ineffective it seemed. The thought lasted about thirty seconds before I stomped on it with twenty years of Sunday-school training, shivering at the thought of allowing this doubt to unravel my entire identity. My father taught me better than this, I thought. When I was young, my father existed in the evenings. Before I woke in the morning he kissed his wife, took his black plastic lunch box, and drove to the same place he would work for over thirty years. It wasn’t important to me where he disappeared to during the day, so long as he returned precisely at five thirty every evening and was at the head of the dinner table by six. “We don’t eat until your father is at the table,” my mother reminded us if he was ever running late. We would sit with elbows on the table and swinging legs, our food rapidly cooling in front of us, before we ever touched it without my father at the table. On September 11th, 2001, my mother called him at his office in hysterics. Like our faith, our family was rooted in tradition. After dinner, while my mother bustled in the kitchen attacking the mountain of dishes with the ferocity, my father would lean back in his chair and debate things with us. From politics to the latest sixth grade drama to whether or not the queen cuts her own steak – there was nothing too silly or unimportant that couldn’t be discussed from all sides. While we spouted fiery opinions, he listened, fingers laced behind his head and the toothpick between his teeth bobbing..
“Ugh, I wish you wouldn’t argue so much,” my mother would complain while vigorously wiping the table in front of us. For a man so purposed with a life of faith, he held reason in the highest esteem. Always be ready to give an answer to anyone who asks you about the hope you have. He was not a reader, but somehow he knew the Bible inside and out. For him, logic and faith were never at odds but rather dependent on each other. So, for twenty years, the existence of God was as certain as my father’s truck pulling in the driveway each evening at five thirty. God was in every day, in everything we did. We prayed before every meal, before bed each night, and – in my mother’s case – whenever she was feeling particularly inspired. We listened to music about God, watched movies about God, and sung to God. The language we used was so familiar to me I couldn’t imagine anyone not understanding what was meant by being “washed by the blood” or “feeling convicted”. Before school each day my mother read us a devotion, although she more often ended up yelling it above the clamour as we flew around the house. Guys asked me sometimes, Exactly how Christian was I? They were testing the waters, I suppose, to see how much of a prude I was. “Dude…the whole Bible?” I could practically see their attraction withering away as we spoke. My father taught us the books of the Bible by naming objects around the house. The door knob was Genesis. The mirror next to the door was Exodus. The coat closet was Leviticus. Before I was even old enough to read the Bible on my own, I could list all of its sixty-six books just by walking from the front door to the couch in the basement. Every Saturday, we worked twice as hard because Sunday was the day of rest. Every Sunday, while my mother bustled, trying to herd us children into the minivan, my father sat at his chestnut desk, took out his chequebook, and carefully tithed ten percent of his salary to the church. Times were tight; my mother either thrifted our clothes or sewed them herself. But no matter how many nights in a row we had to eat boiled potatoes with butter or stitch the same pair of fraying jeans, there was never a Sunday that my father did not sit at the chestnut desk, lick his finger and rip out a cheque for the church. I was at Bible college when I doubted my faith for the second time. It was a New Testament class, and a very educated, fervent man explained how the Bible went from stories told in the Middle East to being the stylish book in our backpacks. “It just seems like a stretch,” I told my friend as we stirred sugar into our coffee after class. He was a theology major, and the words had hardly passed my lips before they were hammered with doctrine he clearly regurgitated from the class textbook. I didn’t say anything else, but God was losing His edges. Spring in the country smells like both hope and uncertainty. While snow dripped from the gutters and shrunk back to reveal soggy brown grass, my father tinkered away in the barn, preparing as best he could for a new season in which things would almost certainly go wrong. Old enough to work but young enough not to get paid for it, I managed to escape from my mother’s neverending list of chores and sat next to my father in the barn while he worked. We listened to Johnny Cash drawling from the dusty radio, and I handed my father his tools. As time went on, my times in the barn grew fewer and farther between as I decided I hated country music and couldn’t wait to leave our small town. When I did sit next to him every now and then, he knew I didn’t want to be there, and after offering him whatever help he had needed, he dismissed me. I didn’t stay longer than I had to. As I got older, my feet got itchy, and my father shifted from a man who existed at the dinner table to one who existed at airports. I bounced from city to city, meeting people and places that kneaded and stretched my worldview like dough. Yet no matter where in the world I was returning from – at any time of day or night – I knew my father would be at the airport with his hands in his pockets, leaning back on his heels. Each time his hair was speckled with a bit more grey than before, each time he hugged me tighter. And each time, as I walked towards the gate, I felt a twisting in my gut as if my stomach was being wrung out, as if I was somehow betraying him. When I left for Asia, God was the translucent sliver of the moon, and when I returned – a year later – He had been completely soaked up by the velvet night. I had lost my father’s God in the cracks between mountains and the faces of injustice, and in doing so, lost myself as well. God was all I knew, and now He…well, wasn’t. Moments before the plane’s wheels kissed the tarmac I felt the twisting again in my gut – betrayal. On the two-hour drive from the airport to our home in the country, I watched as the buildings shrank and the space between my father and I grew. The words I wasn’t saying pressed on my chest like a heavy palm, the truth stuck in my throat. “I don’t believe in your God,” I imagined saying, and the space between us would inflate like a balloon until our fingers couldn’t touch. Feigned closeness was better than no closeness at all. There is a story in the Bible about a prodigal son. The son steals his inheritance, runs away from home, and squanders all his father’s money on debauchery. He eventually becomes broke but still refuses to come home, choosing instead to eat scraps from pigs rather than return to his father. He does, however, eventually slink back to his father’s estate. When I call my father, I cough up the truth. 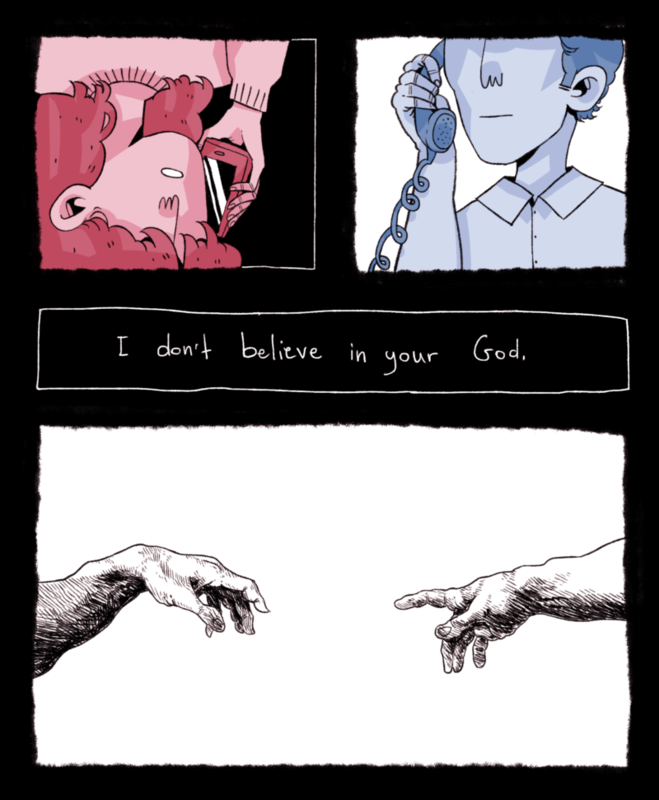 “I don’t believe in your God,” I say. We debate things. The space between us shrinks until our fingers are touching across phone static. My gut unravels. Before he hangs up he clears his throat.